We are pleased to introduce our team of dedicated, qualified and compassionate individuals who provide excellent customer service along with exceptional pet care. began practicing in 2007. After working as an associate, Dr. Miller purchased Uzarski Veterinary Hospital, creating Whispering Pines Veterinary Services in 2009. Dr. Miller earned his Veterinary degree from Michigan State University College of Veterinary Medicine in 2007. Professionally, he gains satisfaction by helping a patient recover from a serious illness. Dr. Miller lives in Lawrence County with his wife and four children. When away from the office he enjoys working with the kids on his hobby farm and golfing. has been an associate veterinarian with Whispering Pines since 2012, when they opened the Grove City location. After earning her degree from the University of Pennsylvania School of Veterinary Medicine in 2000, Dr. Burry has been a practicing veterinarian treating both farm animals in the past and companion animals currently. Her professional interests include ophthalmology, soft tissue surgery, feline medicine and infectious/zoonotic diseases. Dr. Burry resides in a nearby community along with her husband and mischievous orange tabby cat, Sidney. She is active in her church, enjoys reading, traveling, cooking with her husband, watching the Pittsburgh Penguins and wine-making. is an associate veterinarian with Whispering Pines. Dr. Uzarski obtained his undergraduate degree from The Pennsylvania State University and his degree in veterinary medicine from the University of Pennsylvania. Dr. Uzarski opened his own practice in 1971, caring for both large and small animals. Eventually, he limited his practice to small animals only. In 2009, Dr. Uzarski sold his practice to Dr. Matthew Miller and has remained on staff working part time. Dr. Uzarski and his wife of 50 years, Janice, have three married children and 9 grandchildren. Dr. Uzarski enjoys hunting, camping and attending his grandchildren’s sporting events. joined the Whispering Pines team in November 2016 as an associate veterinarian. 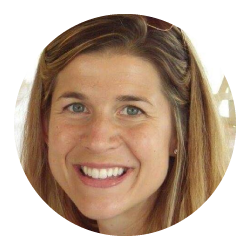 Dr. Celeste received her veterinary degree from Michigan State University College of Veterinary Medicine in 2008 and her Masters Degree in Biomedical and Veterinary Sciences from Virginia Tech in 2012. She has lived in Mercer County for the past 5 years and shares her home with two dogs, two cats and a parrot. joined the Whispering Pines team as a part time associate veterinarian in January 2017. Dr. Palm earned a bachelor's degree from Indiana University with a major in biology and chemistry in 2003. Dr. Palm finished her academic career at The Ohio State University, where she received her doctor of veterinary medicine degree in 2008. Dr. Palm is the regional veterinary medical field officer with the Pennsylvania Department of Agriculture. Dr. Palm and her husband live in Mercer County and have three children. joined the Whispering Pines team in July 2018 as an associate veterinarian. Dr. Missy began practicing in 2016 after graduating from The Ohio State University College of Veterinary Medicine. She previously worked as an associate at another veterinary hospital before joining our team. Her professional interests include treating difficult cases and working as a team with owners to provide patients with the best care. Dr. Missy lives in Armstrong County, and her pets include a dog, cat, horse. When not at work she enjoys fishing, camping, and spending time with her family. has been with Whispering Pines from the start. She enjoys doing the bookkeeping and helping with whatever needs to be done on a daily basis. Carrie’s favorite part of working at Whispering Pines is helping people keep their pets healthy in order to live long and happy lives. Carrie lives in Lawrence County with her husband and four children. She loves reading a good book and having fun with her children. joined our Whispering Pines family in 2016. Karen brings 25 years of management experience to our practice and has a deep love for animals. She lives in Mercer County along with her daughter and Mastiff, Apollo. Karen enjoys volunteering, kayaking, reading and spending time with her family and friends. has been with Whispering Pines since they opened the Grove City location in 2012. Jackie has been working with animals for 17 years and graduated from the Median School of Allied Health Careers in 2004. Jackie is an avid cat person and enjoys working with our feline patients. She shares her home with two handsome orange boys. joined the Whispering Pines Greenville office in July of 2015. In 2011, Ashley graduated from the Great Lakes Institute of Technology for Veterinary Assistants and began her career working with small animals. Ashley lives in Mercer County and shares her home with her two dogs, Oliver and Casey and a cat, Star. She enjoys spending time with her family and friends, fishing, kayaking, hiking, camping and traveling. rejoined the Whispering Pine Greenville team in January of 2017. While in high school, she worked for a local veterinarian and instantly knew this was the field for her. In 2010, she graduated from VetTech Institute in Pittsburgh. Katie has worked as both a small and large animal technician and has also had the opportunity to teach at the VetTech. Her favorite thing about veterinary medicine is how no two days are ever the same. In her free time, Katie likes to teach dance, bake, travel, assist with church activities and read. She resides Lawrence County and shares her home with her dog, Dottie. has been with Whispering Pines since February 2016. From a young age, Shannon knew she wanted a profession in the animal health care field. In 2007, she graduated from the Vet Tech Institute as a licensed veterinary technician. Shannon resides in Mercer County with her two beautiful children, three dogs, two cats and five chickens. is a new addition to the Whispering Pines team. Samantha is a 2018 graduate of the Vet Tech Institute of Pittsburgh. Sam quickly began her career working with small animals. She lives in Mercer County on her family's diary farm where she grew up learning from an early age how to properly care for animals of all sizes. In her spare time, she enjoys showing diary cows, kayaking, spending time with her friends and working on the farm. joined the Whispering Pines Greenville office in July of 2012. In 2012, Chelsea graduated from the Vet Tech Institute and began her career as a licensed veterinary technician. Chelsea resides in Mercer County and shares her home with her two dogs, Waylon and Jessi. She enjoys spending time with her family and friends, kayaking, attending concerts and mud bogs. has worked in our Greenville office for 19 years. Brenda is passionate about the care our patients receive and provides your clients with excellent customer service. Brenda lives in Ohio with her husband and a cat, Callie. 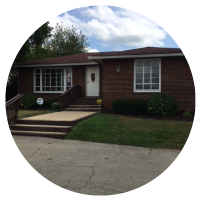 has been with Whispering Pines since we opened the Grove City location in 2012. Marie is one of the friendly faces you will meet when you visit our clinic. Marie has many years of experience in the veterinary field and is eager to follow through with any requests you may have. Marie has a dog and three cats. joined the Whispering Pines team in June of 2017. 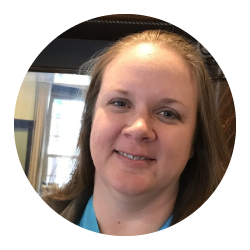 Candi has worked in the customer service field for over 20 years and enjoys working with our clients and patients. Candi lives in Mercer County with her husband, three children and Bear, her beloved dog.